Wondering if anyone can give me the length of the spring, and a source in the US for new ball/spring parts for my A10. Everything I've found on line has been in the UK. I don't mind buying it there, but shipping is twice the cost of the part. Have a look on TSS website on eBay at the moment. They have some NOS piston type units, superior to the ball type and a good price. I have an old ball type lying around , the spring is approx 15 mm long, or ~ 0.575" ( hard to get spot on with a spring) in old money, I have no idea if this has settled or not, , its part of a soon to be experiment. 👍 on TSS. They're my local go to for a65 parts. Classic british spares in California is my second choice for bsa parts too. I believe DMdigan tested the ball and piston type valve and found that the ball type is superior when it comes to leaking past the piston or ball at low rpm and that the oil flow past the ball and seat on higher rpm would make for a self cleaning effect compared to the piston type. Exactly why I want to keep the ball type. - the OPRV mainly comes into use when the engine and oil are cold. In this scenario the oil will be thick and the oil pump will easly pressurise the oil past the 50 psi blow off value. - at normal engine tempratures the accepted oil pressure value is 10psi per 1000 RPM, so you would need to be reving over 5000 RPM for the OPRV to start working with a warm engine. - the piston type OPRV was introduced by BSA as an improvement sometime after 1970, I believe it is more sensitive and can control oil pressure more accuratley. I'm nor sure whether the ball type OPRV is better. - its important to check whether the blow off recess in the OPRV accuratly aligns with the corresponding area in the crankcase. This is generally adjusted by using fibre washers. - another consideration is loss of oil pressure past the first few threads of the OPRV body. Some owners use sealant in this area to ensure oil pressure is not lost through the inner threads. 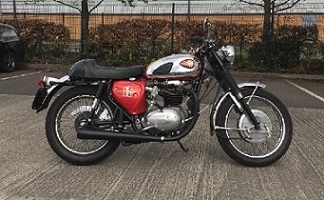 Personally I would try and find a NOS BSA OPRV, you can still get them and they are not expensive. SRM also sell a stainless steel OPRV, this is a good bit of kit but there are reports of the piston galling as both body and piston are made from stainless steel. Gunner.. the BSA workshop manual says 50 psi at 3000 rpm. When using cast iron pump, end feed crank and the tightest possible big end tolerance my a65 has 50 psi at 2000rpm warm engine. Last summer I had the ball valve type and it works excellent. I had the piston type previous for many years and that too worked ok, only made a tighter piston for it from new. But I think I´ll rely on DMadigans testing and still use the ball valve. I've read D Madigans thread several times and talked to a few others about OPRV issues. From what I can gather the problems that arise with the valves are more prevalent in the A65 than the A10, namely that the drain back hole in the A65 case is drilled in at an angle which does not always allow enough threads on the pressure side of the valve to effectively seal it, especially if it has to be gasketed/shimmed in or out to align with the hole properly. I can't say if that's why BSA went to the piston type, but if Mr Madigans tests are accurate, pressure loss around the piston in the bore, even with the threads sealed, is far greater than any loss with the ball type. I have a new SRM oil pump which they claim is "high delivery" Whether this refers to volume or pressure,( possibly both?) I don't know but I would like to be sure the OPRV is up to the task. If oil pressure is severely compromised by oil slipping by a piston in an OPRV, I would say the oilpump is not up to the job in the first place. Folks often look to the OPRV when they have doubts about their oil pressure, stretching springs etc, when the issue is fundamentally bearing wear, or if you're lucky, oil pump wear. the BSA workshop manual says 50 psi at 3000 rpm. Well spotted, I wasnt aware of this pressure value in the workshop manual so thats useful knowledge to have. My A65 is from 68 so doesnt have an oil pressure gauge though I wish it did. Good to hear you are getting excellent pressure via the mods you have done. I'm using a carefully assembled iron oil pump tested in situ by spinning using a cordless drill and checking for leaks at the gasket face and pump ends. I did find some leaks which were cured by counter sinking the pump stud holes which were slightly pulled up and also cleaning up the pump end plate & top joint. I have also sealed the last few threads on the OPRV to crankcase joint to stop pressure leaks in this area. As mentioned I have no oil pressure gauge so cannot tell how successful these mods have been. However, the engine was rebuilt only a few years ago with a new line bored TS journal so I'm hopeful all is Ok. I'm not sure why BSA switched to using a piston OPRV rather than a ball type and can only assume that BSA thought it was a better arrangement. Perhaps one reason is that the ball type can cause rapid fluctuations or chatter in oil pressure as it opens and closes, although I don't know if this was the case with A65's. Regarding leakage past the OPRV I agree it could be a contributing factor to low oil pressure but unless all types are tested in real life scenarios dont know which, if any, type is best. Agreed, any instances of such behaviour? owners that thrashing the bike when cold was not a good idea which they accepted. That's why putting very heavy oil in them to improve running pressure is also a bad idea. they also changed the relief gallery to expel to the suction side of the return pump. is like the old AMAL carbs with similar material slides and bodies, bad news. I think this is quite probably the most useful post on this thread tbh. And I completely agree with the oil viscosity situation as mentioned. There’s a reason cars use oils like 0-30 wts and it’s down to flow rate and tight tollerences. If the viscosity is too thick for the tolerance being used then it won’t do the job your thinking it is doing. If your 40wt is getting too thin during the summer months, your much better off using an oil cooler with thermostat. I know many bikes run fine on 20/50 but it’s not those I’m high lighting. I’ve heard of some people using much higher viscosities and then say how much quieter their engine is.... doesn’t mean it’s lubricating the main shells though. Thanks all for the enlightening answers. Gives me a few things to think about and a few changes I will make. I rebuilt this engine about 1500 miles ago, after having done it 20 years and 20000 some miles before that. When I tore it down the big end shells and timing bush were all in good shape and within specs but the drive side bearing race had a radial crack about 1/3 of the way around which I know was caused by misalignment of the two bearings. AFAIK oil pressure has never been a problem in this engine but no way to check on an A10 that's not been converted to end feed oiling. The only reason for the new SRM pump is I'm tired of the wet sumping with the old pump. I've always used straight weight oil, either 40 or 50W. I'll probably switch to 20W50 even though it's rare this bike gets started in any kind of cold weather and I always warm it up before starting off. I put a oil filter on the return side so the chances of getting something large enough to foul the OPRV are slim(er) but I'll stick with the ball type for now and make a test rig to check sealing properties and blow off pressure. I'll stick with the ball type for now and make a test rig to check sealing properties and blow off pressure. It will be interesting to see what results you get when testing the OPRV, ideally the tests should try to cover real world scenarios which mean using engine oil together with cold startup and hot running conditions over a range of rpm. The suction hole from the valve to the pump is only 1/8" (3.2mm) so this is probably just as restrictive as the ball valve when cold thick oil. 10/40 semi synthetic oil seems to be ok.